It’s taken them two-and-a-half years, but it looks like the Australian media is finally beginning to cotton on to the blatant dishonesty of Tony Abbott, leader of the Liberal Party and Opposition. His latest mistruths are debunked here. What better time than to recall some highlights from his ever-growing litany of false, misleading, and contradictory statements? “Liar” is an inflammatory term which I used to get your attention. Of course, I have no way of knowing the motivations of Abbott or his party; they may believe themselves to be sincere. But if “liar” means “one who makes false statements”, then Abbott is a habitual liar. In fact, I can logically prove to you that Abbott is a liar. This is possible because if a politician promises one thing to one audience and a contradictory thing to another audience, it logically follows that one of those promises must be untrue. Abbott clarified that he has never supported a carbon tax “as leader”, which Crikey described as “the worst recovery since Basil Fawlty, learning his American guest enjoyed the works of Harold Robbins, pretended to be lambasting someone else”. Tony Abbott is ambiguous about whether he accepts the reality of climate change, which is implicitly equivalent to denial. He has claimed that the science is not settled (debunked here), that there is no scientific consensus (debunked here), that global warming has stopped (debunked here), that the world is cooling (debunked here), that carbon dioxide is unimportant because it is a trace gas (debunked here), that “whether carbon dioxide is quite the environmental villain that some people make it out to be is not yet proven” (debunked here), that carbon dioxide is not correlated with temperature (debunked here), that past climate changes imply the current warming is not caused by humans (debunked here), that Greenland was green in the medieval era (debunked here), that “it is an open question how much the climate changes today and what role man plays” (debunked here), that the problem is not urgent (debunked here), that climatologists sometimes “sound more like theologians than scientists”, and – perhaps most bizarrely of all – that carbon dioxide is “weightless”. Abbott described Kevin Rudd’s condemnation of climate change denial as “running around like Torquemada, looking for heresy, trying to create his own version of the Salem witch hunts”. He has also met with Viscount Christopher Monckton, a man who believes climate scientists are conspiring to fake their results in a plot to create a socialist world government. Of course in typical Abbott style, on other occasions he has said climate change is real and his disagreement with the Government concerns what action should be taken. He has described himself as a “weather vane” on climate change. In September 2009, Abbott reportedly told an audience in the small town of Beaufort that the science of climate change was “absolute crap”, but “the politics of this are tough for us. 80% of people believe climate change is a real and present danger.” He later said he made that comment “in the context of a very heated discussion where I was attempting to argue people around to what I thought was then our position.” When asked about it in February 2010, he dismissed it as “a bit of hyperbole” and not his “considered position”, but went on to say “it was the so-called settled science of climate change, that I thought was to be described in language that I wouldn’t use on a family program”. When asked again in May 2010, he clarified that “this idea that the science was settled was not something that I wholly accepted”. He went on to say “there’s no doubt” human activity “plays a part”, but “how big a part, well, let the scientists argue about that”, and “what we should do, therefore, is take prudent and affordable precautions”. This might have been a reasonable position given the level of scientific understanding about three decades ago, but is completely unjustifiable today: scientists have already argued about it and long since reached a conclusion based on overwhelming evidence. You might defend Abbott on the basis that he’s not a scientist. But he also gets it wrong when he’s talking about his own profession: he and his party routinely misrepresent Australia’s political system. In November 2011, Liberal Senator Ian Macdonald claimed Labor and the Greens were about to shut down the Parliament and rule by decree. I must have missed the shutdown of Parliament – though it might explain why Abbott ran for the door. Abbott seems to have missed a key event himself. He claimed in February this year that Kevin Rudd was Australia’s “last democratically elected Prime Minister” and “what I think the Australian people yearn for right now is a Prime Minister who they choose”. This proclamation must have come as a surprise to the incumbent Prime Minister, Julia Gillard, who was elected in 2010. In the Westminster system which Abbott claims to support, Prime Ministers are elected not directly by the people, but by the Parliament, and party leaders are elected not directly by the people, but by their party. Abbott turns this on its head, apparently arguing Gillard is illegitimate because she was elected by her party and has the confidence of the Parliament. The first premise of this argument is that Gillard replaced Rudd while her party was in government. By the same logic, William McMahon was not democratically elected as Prime Minister in 1971. Abbott claims Labor’s leaders are selected by “faceless men”. In reality, Labor’s leaders are elected by a party room of Labor MPs and Senators, all of whom have public faces, some of whom are women, and all of whom were democratically elected via Australia’s electoral system. (I disagree with some aspects of this system, but that’s beside the point.) Abbott came to lead his own party via the same process as Rudd and Gillard. He wasn’t directly elected by the people: he too was elected by his party’s MPs and Senators. There is no difference between the parties’ processes for selecting leaders. The second premise is that Gillard’s Labor Party does not have a majority in Parliament in its own right, and governs with the confidence of the Greens, Rob Oakeshott, Tony Windsor, and (formerly) Andrew Wilkie. By the same logic, Robert Menzies was not democratically elected as Prime Minister in 1940. While the Howard government always had a majority in the House of Representatives, it did not control the Senate until its final term. And if the Liberals believe coalition governments are inherently illegitimate, why are they in coalition with the National Party? Abbott has claimed the Liberal/National Coalition should have won because it received more first preference votes than Labor. By the same logic, Labor should have won the 1998 election. Abbott has also claimed the agreements made to form government were “dishonest deals behind closed doors”. In reality, those agreements are publically available in full here. If Abbott has evidence of less transparent deals being done, he should present that evidence (and he should stop opposing increased transparency of lobbyists). Abbott acts as if he believes he has a right to be Prime Minister which transcends the political system.The logical conclusion of his reasoning is that Australia’s political system is illegitimate and Australia’s leader should be directly elected by the people, seemingly contradicting Abbott’s opposition to the idea that Australia should become a republic. If Tony Abbott disagrees with Australia’s political system, he should say so; otherwise he should shut up. He can’t have it both ways. Abbott said in August 2010: “I think we can have a kinder, gentler polity. I think we can be a more collegial polity than we’ve been. I think that the spirit of Parliament has been needlessly confrontational, especially over the last three years.” His lament was more than a little hypocritical coming from the most confrontational person in the Parliament. Abbott often contradicts his own policies. This happened particularly often in mid-2011, when the Multi-Party Climate Change Committee agreed on the carbon price policy. In July 2011, Abbott described the Government’s emissions reduction target of 5% by 2020 as “crazy” and insignificant. He’s right, but the problem for him is that he has the exact same target. He can’t have it both ways. The central plank of the Liberal Party’s climate change policy is an “Emissions Reduction Fund” which would reward polluters for polluting more slowly, but they have been extremely vague if not outright contradictory on what it will achieve. In May 2011, they said it could mean paying for coal power plants to be closed and replaced with gas-fired ones. Yet in July 2011, responding to the Government’s plan to close 2,000 MW of coal-fired power, Abbott told an audience of manufacturing workers the Liberals wouldn’t close coal power plants and would even build new ones. In October 2011, the Liberals said their policy is to “clean up rather than close down power stations”, whatever that means. Whether they will close coal plants is not a minor detail; it is fundamental. Tony Abbott has tried to hedge his bets on coal seam gas. In August 2011 he said: “If you don’t want something to happen on your land, you ought to have a right to say no.” Once Abbott realized that would mean siding with the Greens against the mining industry, he quickly clarified that actually, he meant the opposite of what he had said the day before: “The Coalition won’t support the Greens; we don’t support the Greens; we’re not gonna support the Greens, because the Greens are just against mining full stop. […] We support the mining industry but we don’t want to see prime agricultural land destroyed.” His actions have come down firmly on the side of the industry: Abbott has done nothing about coal seam gas. In January 2012 he said: “There’s a big difference between coal seam gas extraction and open cut mining: open cut mining is a devastating thing.” This from a man who has built his career on defending the mining industry in all its forms! Abbott and his party also routinely misrepresent the Government’s policies. In May 2012, Abbott claimed “the carbon tax is the death of the coal industry” – if only it were true. Treasury modeling of the policy predicts fossil fuels would still supply the majority of Australia’s electricity by the mid-2030s. Abbott’s oft-repeated claim that the carbon tax “will go up and up and up” is misleading; he makes it sound like it will escalate dramatically. In reality, the price only rises by about two dollars over the fixed price period, then from 2015 the price will be set by the market and could well go down. In October 2011, Abbott’s Shadow Environment Minister Greg Hunt claimed the Climate Commission has the power to increase the carbon tax with almost no notice at any time. In March 2012, he claimed “the structure they’ve built around Tim [Flannery] and others of this Climate Commission gives incredible power effectively to control tax rates and electricity prices to an unelected body”. When challenged, a spokeswoman for Hunt clarified: “the unelected commission gives the target advice to the unelected authority which in turn tells the government what the target and therefore the effective carbon tax and electricity prices should be. If the government doesn’t accept the advice on the target and therefore the effective tax, a default rise kicks in anyway.” All these versions of Hunt’s claim are blatantly false. Firstly, the Climate Commission’s function is to communicate climate science to the public; it has no political power. Hunt evidently meant to refer to the Climate Change Authority which will recommend emissions targets. This basic error raises grave doubts about Hunt’s competence, let alone honesty. Secondly, the Climate Change Authority will play no role in the first three years, and after the first five years of emissions caps are set, its recommendations will come with five years’ notice. Thirdly, it is not mandatory for the Government to follow the Climate Change Authority’s advice. Fourthly, the default target that will apply if the Government doesn’t accept the independent body’s recommended targets is (can you guess?) the Liberals’ target again. Fifthly, electricity prices are affected by factors other than the carbon tax. Again, these are not minor details: they are about the basic governance structure of the policy the Liberals oppose so deeply. The Liberals lied repeatedly when they were in government. Former Liberal Prime Minister John Howard famously made election promises which later turned out to be “non-core promises”. They misrepresented the situation of asylum seekers, most obviously in the children overboard incident. They dragged Australia into the Iraq War based on nonexistent weapons of mass destruction. And like today, they implicitly (and sometimes explicitly) denied the science of climate change. Abbott was a minister in the Howard government. KERRY O’BRIEN: What you haven’t explained is how you can make one promise in one month and then completely change it the next. TONY ABBOTT: I know politicians are gonna be judged on everything they say, but sometimes, in the heat of discussion, you go a little bit further than you would if it was an absolutely calm, considered, prepared, scripted remark, which is one of the reasons why the statements that need to be taken absolutely as gospel truth is those carefully prepared scripted remarks. KERRY O’BRIEN: Mr Abbott, we’re not all leaders of major political parties who are either Prime Minister or aspiring to be. Would you agree there is extra onus on you to be accurate and honest and make promises that can be trusted? TONY ABBOTT: True, true, true. Absolutely right. KERRY O’BRIEN: How are we to know when we’re hearing your true position and when you’re fudging the truth? TONY ABBOTT: I think that most of us know when we’re talking to people or when we’re listening to people, I think we know when we can put absolute weight on what’s being said and when it’s just the give and take of standard conversation. What I want to know is: can we put absolute weight on Abbott’s claim that carbon dioxide is “weightless”? Occasionally I find myself agreeing with one of Abbott’s myriad points of view. Perhaps that’s why he contradicts himself so much – it increases his chances that everybody will agree with him about something. Unfortunately, nearly every time he says something I can agree with, he says the opposite within 48 hours. How can we trust Abbott and the Liberals to cut emissions by 5%, to close coal power stations, to stand up to coal seam gas companies, or even to believe that humans are causing global warming, when sometimes they say they will and sometimes they say they won’t? How can we know anything at all about what they will do, when they constantly contradict themselves? For a long time, I was deeply perplexed by how such a public figure as Abbott could get away with so blatantly and frequently contradicting himself. It seems there is almost no statement so silly that Abbott and his colleagues won’t say it. Eventually I worked out the key is repetition. Abbott has a handful of central messages which are broadly consistent, expressed in three-word slogans, and repeated endlessly. These are the messages that get across, while the spectacular contradictions and gaffes are forgotten because they are usually one-offs. Therefore all those who oppose Abbott and his party must constantly remind the public of their dishonesty. This article was quickly dashed off (albeit drawn from notes I’ve been gathering for ages). An exhaustive list of Tony Abbott’s and his Liberal Party’s false and misleading statements, let alone other failings, would take forever to write. The gaffes mentioned here are only the ones I remembered to write down – I am sure there have been plenty of others I’ve forgotten about. 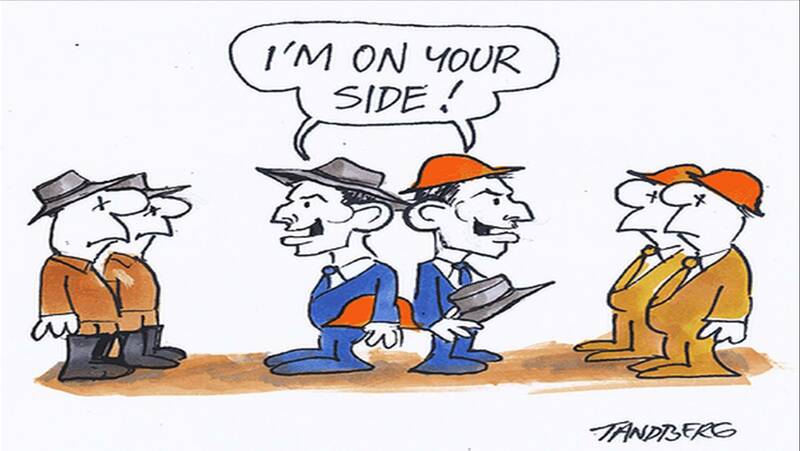 If the key issue in the next election is trust, then Abbott and his Liberal Party lose hands down. I’ve asked myself the question of your title so many times. He either lies or is stupid every time he calls asylum seekers ‘illegal immigrants’ or explains that word by claiming they’ve chosen not to stay in the ‘safe’ countries they’ve passed through on the way. If he doesn’t know that asylum seeking is legal and those countries are not safe for all sorts of reasons, he should. If he does know that’s another lie every time he talks about it. Either way I don’t want him as a leader. I noticed that in a Q and A before the election, talking ‘less loosely’ he didn’t use that term, but I suspect that now he’s taking advantage of a public attitude he perceives to have changed and has returned to the demonising language of the Howard era. he has been challenged on it, but continues to use that word ‘illegal’, part of the technique of repetition you mention in this excellent article. Thank you. No Anonymous (but not brave). Jeremy Andrews does not need help, with The Mad Monk a the help, we all need help. The Mad Monk is both stupid, mean and dangerous, he has no moral compass. Like George Pell – (friend and protector of all pedophiles) and Tony’s mentor, all these kind of people care about is Power and dam the consequences.